Ground floor shops w. apartments above. When Paul finally arrived as a prisoner in Rome, Luke records that he was “allowed to stay by himself, with the soldier who was guarding him” (Acts 28:16). The lodging is described as some sort of ‘guest-housing’ (τὴν ξενίαν in Acts 18:23), the expenses of which Paul was to pay (μισθώματι in Acts 28:30). 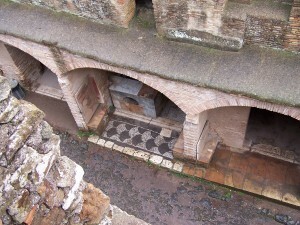 * Given the circumstances, it is probable that Paul rented a low-income apartment in Rome. There is good reason to believe that apartments in Rome were as much as four times more expensive than those elsewhere (Rapske, The Book of Acts, 234). As one might expect, the higher your apartment, the lower the price (and quality). What made apartment living particularly unfavorable in Rome was the notoriously poor construction of apartment buildings. In the picture (above) you can see the typical building design: ground floor shops opening to the street with apartments above (taken during my visit to Ostia). Considering the circumstances surrounding Paul’s imprisonment, Rapske suggests that “Paul…hired a third storey or higher apartment” (239, cf. Bruce, The Book of Acts, 509). The striking part of the Acts narrative is what takes place in this apartment. With a Roman soldier standing guard, Luke reports Paul as setting up meetings with “leading men of the Jews” (Acts 28:17, 23) and welcoming quite a stream of others during his two year arrest (Acts 28:30). Further, Paul is “preaching the kingdom of God and teaching concerning the Lord Jesus Christ with all boldness, unhindered” (Acts 28:31). I particularly find Rapske’s assessment interesting: “Luke closes with a picture of a prisoner whose place of confinement has become a house church” (313). If I might paraphrase Paul’s words during what I hold to be another imprisonment: “Though I’m locked up as a criminal, the Gospel is not bound!” (2 Timothy 2:9). *Some debate whether the two references refer to the same location. Perhaps a discussion for a future post. ← Should Authors Use Pseudonyms? i love the pic you provided. is it your own? i certainly get a sense of satisfaction when i use my own pics from israel in presentations and such lol. and, you’ve provided some excellent context here, keep it up. Thanks, Mike. Yeah, I visited Rome, Ostia, Pompeii, and Herculaneum in January. Most of the pictures I use for the backgrounds posts will come from the trip. Given my limited expierience of life in Europe I would venture to say many of those things are the same to in a Roman apartment today. I can say that there are a lot of similarties to Madrid apartments. Hey Ben! I’m glad you stopped by. Interesting… I’ve never been to Spain, but it seems that apartments haven’t changed too terribly much over the years! You mentioned a 2nd Roman imprisonment. As we were finishing our study of Acts in Bible Study a couple of weeks ago, a commentary suggested the 2nd different imprisonment. We had always just assumed that Paul was killed at the end of the two year imprisonment in Rome. Unfortunately, the commentary only had a sentence or two about 2 imprisonments. Could you say more or point me to where we could learn more? (My apologies if you’ve already blogged about that. I just stumbled this blog posting by accident tonight with a Google search). No problem. There are some who suggest Paul was only imprisoned once. They also claim that there are major discrepancies between the details in Acts and the information we’re given in Paul’s writings. I disagree (as do most who tend to be on the ‘conservative’ side of the theological spectrum), though I’ll leave that discussion for another time. In 2 Timothy, Paul discusses his circumstances as a prisoner awaiting trial (esp. ch. 4). Piecing together a chronology of the NT suggests that this is a second imprisonment in the mid to late 60s. For more information, you might check out some commentaries on 2 Timothy (or the ‘Pastoral Epistles’- most commentaries on 2 Timothy will actually cover 1 Tim, 2 Tim, $ Titus). Thanks, Josh. Do you have any information on whether upper floors were normally of brick or wood? Also, anything on window coverings? You may have seen my recent blog article on the insula from which Eutychus fell. I’ve not come across any suggestive statistics in this regard.